Hey Kurt! Thanks for taking time to chat with us. Always a pleasure. Thanks for featuring me at Real Gone again! You’ve just returned home after a UK tour. How was it? I only wish it could have been a little longer! We had a blast though. We started out the week with two gigs in London. The first one was in Hackney at a place called Paper Dress Vintage, a nice second hand clothing store that is two floors packed with clothes. When we arrived I wasn’t even sure where the stage was! Well…we finally found it and did soundcheck and went off for some fish and chips. On our return the place had transformed into a genuine rock club and all the clothing had been taken away. I have no idea where they put it all! I was even told in one room there was some yoga going on. That place is a labyrinth! Nice though! At that show, we had the pleasure of playing with one of my favorite groups going at the moment, Los Pepes. They sound like a Spanish band, but they are based out of London and are super great guys. We had a show fall through in Nottingham so we ended up spending the day off in London. We went to see Baker Street, as I’m a big Sherlock Holmes fan, but instead of waiting in the queue, [Combo guitarist] Jorge and I just spent the afternoon in the nearby Weatherspoon pub [laughs]. We had a killer barbecue at our friend’s house that evening and topped it all off with a good party. The next day came with quite the hangover, but we played again in London with The Fleshtones which was a lot of fun. Brighton was probably my favorite gig of the short tour. Fish and chips with Clive from the Surfing Lungs was super tasty and that night Darrell Bath joined us on stage for a couple numbers. Darrell’s played with all the best; Vibrators, The Boys, Johnny Thunders…and then the big one for me – Ian Hunter! After the gig, we got taking about music. He’s the real deal and a rock ‘n’ roll survivor. I loved Brighton. Our last show was at a little record shop/cafe in Ramsgate. It was nice weather the whole week but fifteen minutes before the show, it started to rain cats and dogs! I broke two strings during the set and had to change them during the show since I didn’t have a back up. Regardless it was a lot of fun. I ate some Indian food after that was so spicy, I’m still reeling from it! All in all, a wonderful little tour. That was your first UK visit since 2009 with your old band The Leftovers? Yep, it had been awhile. I was in London a couple years ago with Bullet Proof Lovers, but just for one gig. So this tour was nice to do, and of course it was amazing to see so many old friends from my old days with The Leftovers. We came from a close-knit pop punk Ramonescore scene and met a lot of great people from all over Europe who were living in England when we toured there back in ’06 and ’09, so coming back this time, it was super nice to see old friends. I was so happy to know that everybody is doing well. Earlier in 2017, you released ‘In Orbit’. It hasn’t really been that long since your last solo record and other records with Bullet Proof Lovers. What keeps you so motivated? ‘In Orbit’ and the last Bullet Proof record were recorded around the same time in 2015, but the way things are with releasing records and what have you, they didn’t come out until recently. I guess what keeps me motivated is that I feel the need to be active. It’s lead to non-stop touring, which is pretty gruelling, and sometimes even with all the hard work, you don’t see immediate results, better album sales or crowd attendance. I feel that if I stop and take a break, though, the momentum will die. Perhaps it might be good at some point to take a breather and let things settle and see where the pieces fall, but honestly I’m not sure what I’d do if I wasn’t playing music, recording or touring. I’d be pretty bored. [laughs] I’m interested in a lot of things, but right now I’m still completely focused on staying active with music. Do you find it hard writing new material? When I was younger the songs really poured out with no problem. Nowadays I find it a bit more difficult to find time to work on tunes but only because we are playing all the time. For me I need to be in a calmer environment to really work out a food arrangement or a demo, but the ideas are still flowing up there in my mind, so that’s good, I guess. With music, I’ve always been a fan first. So with that, there is always new bands and new records to discover, so I’m never not feeling influenced to write new tunes. Is there going to be another Bullet Proof Lovers record? That’s the plan, but I’m not sure when it will be record and released. I know that the guys have started to work on new songs. With Bullet Proof, I handle the lyrics and the lead vocals, which is a bit different than the combo, where I do all the songwriting. For me it’s a great change of pace to collaborate with the guys in Bullet Proof. It’s a different sound and a different energy and we all have a lot of fun. So, with Bulletproof Lovers, the music’s already near complete by the time you get involved? Pretty much so, yeah… The thing about Bullet is that they are so versatile and they work hard. By the time I’ve arrived the music part is 98.9% finished. I’m a big fan of what these guys do and normally what I hear on the demos is fantastic. Luiyi, the lead guitarist, is one of the best players I know. He puts a lot of time into creating his solos, using the perfect textures in sound…and it comes out very melodic. I get a lot of his guitar licks stuck in my head! So in the end, my duty is to work out the melodies and write the lyrics. It’s always a team effort with Bullet and it’s a lot of fun. How do you decide which other projects to get involved with outside of your own solo work? Usually if I’m interested in getting involved with project, it’s either because it’s with good friends or that I love the songs. Usually it’s a combination of both. With regard to the New Trocaderos and Kris Rodgers, I grew up with those guys and we’ve all played in groups together for ages. Mike Chaney who writes the Trocs songs has a nice knack at writing great tunes. Bullet Proof come from a punk scene that is almost legendary in Spain, so when I had the opportunity to work with them I took that as a learning experience because they are all so talented and great performers. I’m working on a new project as well with a band called The K7’s which is a group composed of guys from Spanish pop punk bands called Los Reactivos and Airbag. Luis, the singer and songwriter is a great friend and a terrific composer, so I couldn’t say no when he asked me to help out. Sometimes it feels like a bit much to be involved so much, but I’m so lucky to be able to play music, so why not dive in head first and do as much as possible, y’know? A few years back, you collaborated with Dan Vapid. How’d that come about? Any plans to work together again? That ‘Want You Around’ 7″ included a few covers. You’ve released a few cover tunes now. How’d you choose the songs you’d like to cover? It all started with my first “solo” record called “Got It Covered”, which was made when the Leftovers were disbanding. It wasn’t really my favorite idea to do tons of covers, but at the time it was a fun record and something new. Since then I’ve recorded more cover tunes, but I’ve always tried to leave a bit of originality to them…or in some cases update them to sound a bit more modern. It’s hard to make a cover tune that’s better than the original, but I’ve always tried to make my covers sound fresh. Your version of Billy Joel’s ‘Sleeping With The Television On’ is a favourite here at Real Gone. Thank you!! ‘Glass Houses’ is such a great record. Jolly Ronnie Records put the song out and I think it was Ryan who runs the label who suggested the cover… I couldn’t say no. There is a video on YouTube of Billy Joel freaking out on stage, in Russia I think? Anyway, if he ever hears my version, I hope he doesn’t freak out like that! A few of your albums have been distributed via Rum Bar Records. Is the connection between you and the label an ongoing thing? I’ve known Malibu Lou since my days with the Leftovers when he was working distro on the album. He also lives in Boston and is very much a figure to the Boston rock ‘n’ roll scene which we’ve always had a connection with. He’s a true and honest guy and loves a good party. His label is a small operation but he puts his heart and soul into the thing.. I’ve got a lot of respect for Lou and he’s always been such a great help. Down at the Rum Bar everybody is family. As long as Lou continues to work in rock n roll, my buddies and me will continue to work with him on various projects. You mentioned being “across the pond” from the States earlier. How’s being based in Spain working out for you? Spain is a great place. It’s had a history since the 80’s as being this like holy land for rock n roll and in some respects that’s still true, but as with everything, it’s not the same as it once was. You’ll still find a lot of enthusiasm for rock n roll, though. Is there a big punk and power pop scene over there? We get amazing groups touring here all the time and the clubs are usually packed. But at the same time it’s an older audience and you aren’t seeing a lot of younger kids coming out to shows. I fear that it’s the same in many countries. With that said, there are still more rock n roll bars in my current town of Madrid than any other major city that I can think of, so that’s still pretty groovy! Your chosen power pop style is very retro, especially considering your age. How did you discover those influences? Unlike most kids my age, growing up I was a huge fan of Oldies radio. We used to have a great radio station called Oldies 100.9 in Portland, Maine that had an amazing playlist. They even had a call in request night on Sunday evenings. I used to call up all the time to request the Turtles. I swear I must have been the only nine year old kid listening to that show. Anyway, just from listening to the radio or watching VH1 classics, I was exposed to a lot of new wave hits like Devo, Blondie or The Vapors. Then I got into punk rock and eventually that lead me to power pop, which was like new wave punk bands playing Beatles tunes. It was perfect, so I was kinda hooked from then on. Power pop is a love/hate thing for me because I feel the tag is so limiting at times, and especially for what I’m doing now. Yeah, it’s power pop, but it’s also rock n roll. It’s easy to get pigeonholed, especially with playing melodic guitar based music, to get pigeonholed, but I’m hoping, especially with the next Combo record to expand on the musical horizons. The Combo are gearing up to record a new full length album in October for Little Steven Van Zandt’s Wicked Cool Records that will be out next year. This will be our second record for the label. Before that I’ll be releasing a EP, which will be a collection of songs from 7 inch Singles that are out of print as well as some unreleased tracks. That will be out this September i believe. And of course we will be touring around Spain for the rest of the summer and into the fall. Do you think the touring after that will involve another trip to the UK? It took a long time for us to finally return, and I must admit, the UK is sometimes a bit like the United States for smaller independent touring bands. The deals sometimes aren’t that great and finding accommodations can be difficult. For me to return to the UK is absolutely worth it, though and it’s something that is a high priority for us once the new Combo record is out in 2018! We will be back! 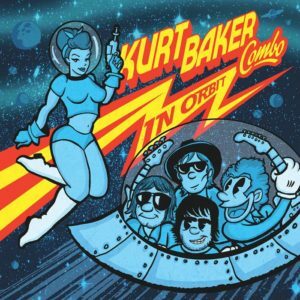 This entry was posted in Interviews and tagged brighton, interview, kurt baker, kurt baker combo, london, pop punk, power pop, uk tour by Real Gone. Bookmark the permalink. Good read. Hopefully Kurt will play Ramsgate Music Hall at some point. Definitely suggest him to Jules.